Beer can be more than just a bottle. As any craft beer aficionado knows, the glassware can be as important as the beer itself. But once a year the beverage world turns to packaging: Much like how a good label can affect a beer’s popularity and sales, so can an engaging package. Winter seasonals, as you can see in the following pages, often reflect our natural surroundings. Leaves, snowballs, cabins and lots of Santas. Other times, it’s what comes with your beer be it a glass or book. Anything to make their product jump off the shelves and into your hands. This unique, limited edition gift set comes with eight beers from HE’BREW – and candles – so you can make your own Menorah. Lest you find yourself at a crossroads on just how to do this, it comes with instructions—and some suggestions like placing a bottle of beer in Matzo Ball soup—on how to put your beer Menorah to good use. Did I mention it comes with a glass as well? L’Chaim! $30. Available at Whole Foods, Total Wine, BevMo, Cost Plus and other retailers. A Britsh red ale meets a Belgian wibier in this seasonal offering from Mikkeller, brewed with American hops and bitter tropical orange peel. What better way to enjoy your bottle of Holy Grail ale than with this commemorative goblet? This 12oz ceramic cup would make a great addition to your drinking vessels collection. An Old World Dunkelweizen brewed with Texas peaches and roasted pecans. The malty flavors of this dark wheat ale are enhanced through the use of malted barley and wheat, from the seminal Texas brewery Spoetzl. 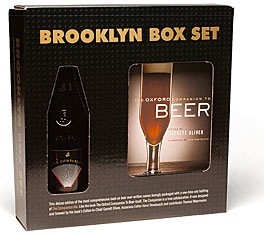 This limited edition comes with the massive Garrett Oliver-edited The Oxford Companion to Beer. Signed by the brewmaster, this book crests in at almost 1,000 pages and features 160 beer industry experts weighing in on a myriad of topics and claims to be the most comprehensive book published on the subject of beer. As if that wasn’t interesting enough, it comes with a bottle of The Companion Ale,an old style wheat wine. $80. 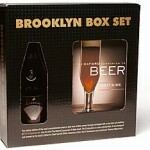 It can only be obtained in person at The Brooklyn Brewery, Williamsburg, Brooklyn, NY. Beer can come in all shapes and sizes. Hobgoblin’s Dark English Ale is included in a glass & bottle gift set in a collectable tin. Rogue Ales emblazons their bottles of Santa’s Private Reserve —a double-hopped red ale—with a fist-pumping jolly old St. Nick. Mother Earth Brewing Co.’s Silent Night – a bourbon barrel aged imperial stout – comes caged- and-cork in a 750ml bottle. Anchor Brewing’s Christmas Ale magnum would make an impressive present to any beer lover. Highland Brewing’s Cold Mountain Winter Ale is a spiced ale which comes fashioned with a resealable flip top. St. Bernadardus’s Christmas Ale (a Belgian strong dark ale) and The Lost Abbey’s Gift of the Magi (a golden ale) both offer their seasonal beers in caged-and-corked 750ml bottles. Samuel Smith offers a gift box that comes with their Winter Warmer Ale, a pint glass and a pair of coasters. There’s a myriad of ways to depict the holiday time of year. And breweries rise to the challenge. Bell’s Brewery’s Christmas Ale—A Scottish ale—goes for a design of understated simplicity, as does Deschutes Brewery’s Jubelale. Smuttynose Brewing Co.’s Winter Ale, New Holland Brewing Co.’s Cabin Fever brown ale and Brouwerij Huyghe’s Delirium Noel all maximize the use of snow, indicative of the climates in which their breweries are located. Winter means many things to many people. In the case of Northern California’s Anderson Valley Brewing Co. and their Seasonal Ale, that means celebration of the winter solstice. For Maryland’s Heavy Seas Winter Storm and Flying Dog’s Winter Ale it is all about the storm and its resulting chilly playground (much like the kleptomanic snowmen of Weyerbacher Brewing Co.’s Winter Ale). Sierra Nevada echoes the age-old sentiment that nothing seems more soothing in a snow-covered cabin than some Celebration Ale.